Dalyan is located in south-western Turkey and is one of the most beautiful landscapes in the Turkish Aegean coast. The Dalyan River connects the Koycegiz lake on the Dalyan Delta and the Mediterranean Sea. This unique nature reserves about 250 species of birds and the Caretta-Turtles called Caretta Caretta. In the nearby vicinity is the ancient city of Caunos which dates from the fourth century BC. Ruins from Roman times as example a theater and countless other old buildings. The locals use the Dalyan Delta to take small excursion boats to the famous Iztuzu beach. Speedboats and yachts are not allowed at the Dalyan delta. The Iztuzu beach is five kilometers long and serves as a spawning ground for the Caretta Caretta. 1988 construction of hotels was stopped by British and international conservationists on the Iztuzu beach and the entire region is now considered a unique nature reserve. 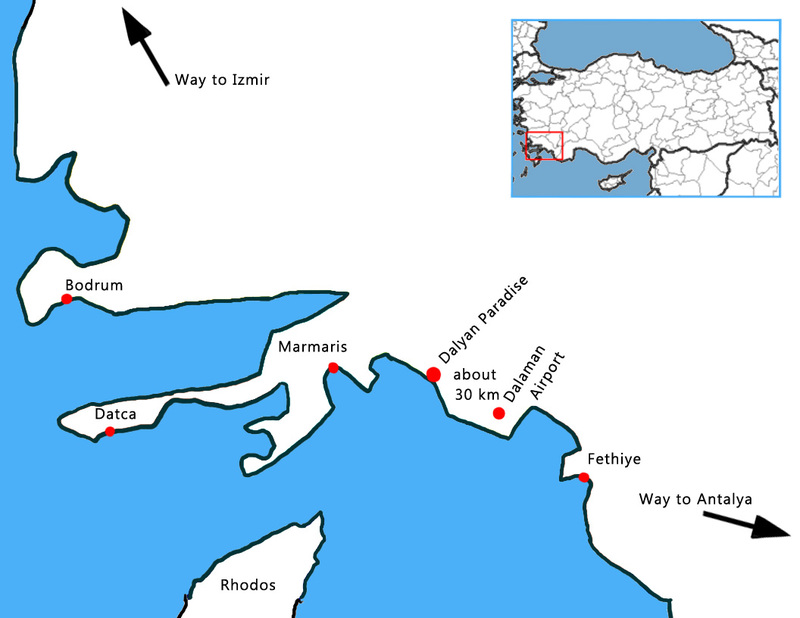 In addition, the Iztuzu beach can only be entered from 8 am to 8 pm. Outside of these times, it is strictly prohibited to stay on the beach. June Haimoff, now 91 years old born in England called by the locals affectionately "Kaptan June" lives in Dalyan for more than 25 years. She set up a Foundation (http://dalyanturtles.com) to save the Caretta Caretta and is instrumental that the Iztuzu beach still belongs to nature. Dalyan has several landmark. The most famous are the monumental tombs that have used the Lycians about 2000 years ago to bury high up their dead near the sky. This landmark is illuminated at night and offers everyone a unique view. Hot springs are one of Dalyans most famous spots. There are three thermal baths in Dalyan. The most famous is Sultaniye, which appears on the other side of the river. It´s greate against rheumatism and skin diseases. It is also said that the mud brings back youth. Dustin hoffman thought the same and visited a decade ago the mud bath. As you can see with success.